Let’s just admit it. Battlefield 4 was never a game you were going to play for the single-player. And thank god for that, because in DICE’s latest entry in their fantastic, consistently polished military first-person shooter series, the campaign is useless and forgettable. There are these big set-piece moments—the Michael Bay explosions and extravagantly violent and precarious situations you and your squadmates find yourselves in—that set an exciting tone for all of a few seconds. The world is on the brink of war, and it looks like you and the rest of the Tombstone squad are riding that fine, dangerous line that circles all around it. Like almost everything hinges on you carrying out one mission on top of the other. It starts out simply enough, with some shooting and near-death escapes. Getting chased by a helicopter while grounded on four wheels, sliding out the driver’s seat to shoot the chopper down with a grenade launcher. Just a day in the life of a Tombstone marine. You’re grabbing intel on the imminent uprising in China and escorting VIPs stashed away in the country back to safety. All the while you’re unlocking new weapons as you fulfill each mission with a higher score. Basically the more you kill people, and the more artfully you go about doing it, the higher your score. I routinely unlocked the Gold score without much effort, though I consider myself to be a seasoned shooter, so take that how you will. And then things get a little...monotonous, at least in terms of the level designs. There are repeat patterns of enemies. Large outdoor areas filled with roughly 20 enemies on foot, all with varying weaponry. Some heavy units armed with RPGs or machine guns. Some sharpshooters. Standard issue foot soldiers carrying assault rifles. And then a tank or two. I did not quite enjoy the routine dance of laying literally dozens of mines on the ground to kill the tank and then slowly sniping my way through the rest of the enemies. See, there are ammo refill crates posted reliably throughout each level. It makes it easy and all too alluring to stand there and pick off enemies while you refill on ammunition like you’re constantly on a mission for the perfectly filled magazine. I had a hard time having fun in one area in particular. A level about halfway through the game is literally a series of these exact setups. Either my checkpoint system wasn’t working when walking in between them or there just was no checkpoint. If I died, it was way back to the beginning. The first time I died, it was an hour’s progress lost. The next time I had to do it all over again it only took about 30 minutes—I started to get really good at that first clearing. Occasionally in Battlefield 4’s solo campaign you’ll meet some variance. Jump out of a plane to land on a ship, ready to attack immediately after landing. Ride a speedboat while shooting down those of the enemies’. Hike around that quintessential snow level. You know the sort of thing if you’ve ever played any shooter ever. There are moments where this campaign was fun, where I let out a squeal of delight for something awesome I’d just seen or pulled off. But that’s me: I still love first-person shooters. I’ll never get bored of watching a tank explode after I’ve sneakily loaded it with C4. I’ll never tire of placing that perfect headshot or going on a particularly thrilling killing spree. That I can issue an order to my squad to lay heavy fire on a group of enemies while I swing around to attack them from the flank is also pretty satisfying. Because, really, your squadmates are useless otherwise. Battlefield 4’s campaign felt like I had to stay on my toes a lot more than I remember the series requiring. Your cover is being destroyed around you and the enemy AI moves around a lot. They’ll even try to flank you, come up from behind. Smart. They throw grenades frequently (seriously, how do they have so many), they work together fairly well, and they somehow know where you are at all times. And they’ll always aim for you. Your friends are not much of a distraction until you’re sending the order to engage. Eventually you'll start to really keep your eye on the directive's cooldown. 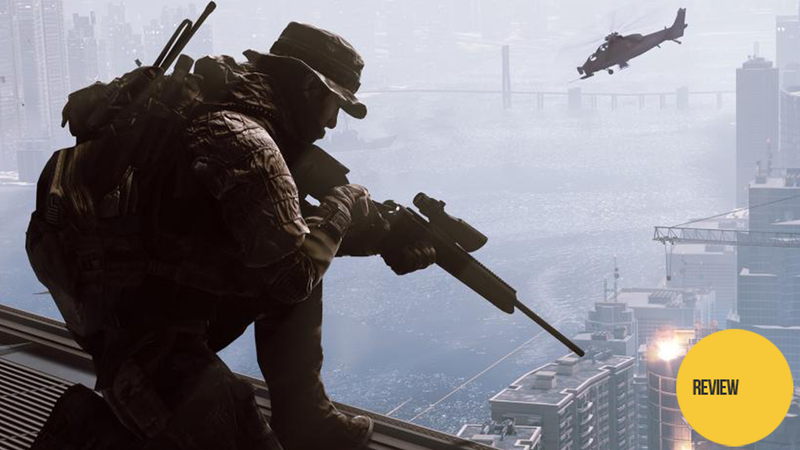 Battlefield 4 takes some cues from stealth games, as well. The new enemy detection warning meter coupled with the binoculars that let you tag spotted enemies in the trademark Battlefield-orange color might make you think of Crysis or Far Cry. You’re often encouraged by your AI squadmates to seek out the less destructive path by sneaking around, but let’s get real. You don’t make a game and tease all its cool qualities like buildings that can collapse provided you shoot its walls enough and expect people to take the slow and steady route. Plus, it’s pretty hard to play this game on stealth, which I suppose is a nice challenge to anyone who wants to make the campaign that much more difficult for themselves. Now, I know that I’ve glazed over the characters and the story a lot, but that should automatically give you an impression of how the game treats them itself. There’s China, on the verge of revolt since the apparent death of its leader, Jié. There’s Russia, who the US believes may be planning on supporting the next Chinese leader, Chang, also known as the villain in BF4. There’s Tombstone, the fearless, reliable squad of marines. It’s made up of mainly you, who they call Recker, a young yet capable and loyal mate named Pac, and Irish, who is a spitfire but is equally dedicated and seems to be a good person. You’ll bond with these guys a bit throughout the game. You’ll have the usual conversations—the ones that alternate between military guy “oorah” speak and a few personal moments thrown in for good measure. You are a silent protagonist. One of those whose personality and voice I suppose you are meant to insert into the moving arms you see on screen. That’s usually the intent behind silent protagonists—to give you the room to implant your own motives and thoughts and deep and foreboding voice if you so choose. But that’s not what happens here. Recker feels like he’s thoroughly incapable of speaking. You’re spoken to without any expectation to answer questions. You’re given at most an opportunity to gesture back, maybe once, throughout the entire game. Worse still is that you’re supposed to be this squad’s leader. And yet it seems like Irish is the one making the calls. Granted, it fits his personality some, as he tends to act on his own accord without much respect to anything but his own moral compass. But the weird, unspokenness of it all is reflected pretty much everywhere else, too—except for the battlefield, of course, where you’re king. An example: we’ll go talk to Garrison, the guy giving us our orders throughout the game, and he’ll speak as if he’s talking directly to me, but my squadmates have lined up in front of the guy, literally not giving me any room to face my boss. Another example: someone will lay a map down on a table and I can’t swing around close enough to get a good view of it. A third: we’ll come upon a big slice of scenery, setting the establishing shot for the next mission, and I can’t get around my mates to check out the view they seem to be in awe over. Once they’re finally done talking, they run up ahead. I take a moment to stand where their boots once made footprints, in front of the perfect view, soaking it in. They’re already calling for me to hurry the hell up. I feel like I’m along for the ride when I’m supposed to be directing the show. I feel like I stepped into someone else’s game, with someone else taking charge, and I’m just there to kill people. I’m the tank. I’m a meathead who can’t even respond to a question with a simple Yes or No. If a silent protagonist is handled well, you’ll feel like it's right for him or her to not say a word. You’ll fill in the blanks of what’s going on in his/her head. But Recker feels like a drone. Like the only way he got to where he is today is because of his usefulness in battle and nothing else. You’re certainly not calling the shots. You’re certainly not moral support. You’re not smart or witty or a leader. You’re just a good shot. But, really, who cares? Battlefield 4 could ship without a single-player entirely and I would not begrudge it. In fact, in a few months’ time when everyone is knee-deep in ranks and customizing weapons, no one will remember Recker and his meatheadedness. No one will care about the facepalm-worthy ending. Because no one gets Battlefield for the story. It would be great—a breath of fresh air!—if we could have a quality campaign, but I was never really hanging on for one and I don’t think most Battlefield fans are either. We’ve certainly seen military first-person shooters succeed there in the past—perhaps, you’d argue, even in Battlefield itself—but it’s not something I expect anymore. Especially considering how much longer the shelf life is for something like multiplayer in a first-person shooter. There’s just no challenge quite like honing your skills against the kids that seem to have infinity hours to practice while you’re away at work. The new knifing system is interesting. First off, there are of course several knives to choose from. Eight, to be specific—shanks, machetes, that sort of fun thing. But more importantly there’s a new counter-knife prompt that if you hit *just* right you can knife your knifer. It’s one of the most pleasant kills you can get if you manage to foil your attacker’s knifing plans, and one of the most aggravating if you’re the one whose plans are getting foiled. You’ll never get a counter-knife prompt when you’re getting knifed from behind, though. It’s pretty neat and is especially fun to play around with in knife-only rounds. There’s a new system that lets you peek over a ledge. It’s pretty useful, keeps you under cover, is not too far from other, similar features you’ve seen in other shooters, but it’s a nice addition. It’s hard to angle just right to get the prompt for it, so it’s kind of useless in multiplayer as far as I can tell. At least if you’re the kind of player that likes to be quick on their feet (which you kind of have to be in these games). You’ll see all the same modes you’re used to, plus a few fantastic new ones. The standard Battlefield specialities that include capturing and securing areas or devices, as well as the go-to, straight up killing modes. Everything you’re used to, you’ll see here again. The pre-launch servers haven’t been too diverse, so I haven’t logged in enough time in all of them, but so far I quite enjoy the new Obliteration mode, which tasks you with grabbing a bomb and setting it off in the enemy’s base. It’s a game of tag and inspires more laughs at failures than rages, in my experience. I guess its smaller-scale brother, Defuse, is pretty fun, too. Once you’re dead in Defuse, though, you’re dead, and I didn’t feel like the mode was as robust as Obliteration because of that. Every mode can be tweaked, as well, with specifications ranging from whether or not there are vehicles allowed in that particular game to including a kill cam feature or friendly fire. It goes deeper, too, like whether you’ll spawn randomly or if you’re allowed to pick where you want to spawn or whether or not you have regenerative health. Changes like that can drastically impact the pace and feel of the mode. Lots of crashes. A few bugs. I wasn’t unlocking anything (weapons, gear) for the first few hours of my playtime until the developers jumped on a fix for it. Of course, this is just the status of the game pre-launch, so they could be up and ready for the public by the time this review runs, but I can give a better impression after I’ve spent time checking out the post-launch situation. But the game has completely crashed more than a few times (in single-player, too). Levolution is a dumb name for a cool feature. There are a handful of different maps—the ones that are more close encounter and the ones that are wide open, ripe for vehicular combat, including the brand new naval combat—but there’s more to the variation than just what you can pick and choose on a server. Everything from weather to the far cooler feature of being able to watch as buildings collapse because of the damage you and your battlemates unleash on it will impact what a map looks like. The side of a building crumbling to bits means you’ve got a new exit or attack point. An entire building falling to its death means a sniper can’t perch on top of it anymore. You can destroy levees and flood part of the map, forcing everyone to swim. You’ll block off paths and create new ones. Battlefield has always been a playground of death, and now DICE has given you even more play-doh to work with. It seems like customization from guns to vehicles is pretty robust, and also fairly standard in games like these. I haven’t leveled up enough to play around too much, but there are all sorts of guns and things you can put on guns once you start playing enough of the multiplayer. You can also customize your field upgrade bonuses to change how your character plays. That last one works to reinforce Battlefield’s already naturally-encouraged team-based play (at least compared to most other games of its kind). Some of these bonuses emphasize your abilities as a medic, engineer, etc. and others change how you move or how much defense you’re getting. The better your team does out there on the field, the more upgrades you’ll have access to. I’ll have a lot more to say about customization, the different modes and what kind of tweaks you can add to them as well as battlepacks that you can unlock to drop goodies mid-game. Hopefully soon we can talk about the more massive 64-player rounds that Battlefield 4 can support on next-gen consoles. But basically: I need to rank up a hell of a lot more to get to the in-depth stuff and see you all out on the killing field before I can give a firm judgment on Battlefield 4’s multiplayer, but it sure as hell isn’t getting a Kotaku-branded Yes for its single-player campaign. I’ll update with more impressions as soon as I’ve got them for you. Update: With multiplayer still incredibly shaky, we're waiting for things to settle down before we can determine a straight "Yes" or "No" here. Most of you will have probably already made your own determinations, but we can't safely suggest or warn against this one until we know for sure what the multiplayer plays like under reliable, stable conditions. But it's safe to say that when it does work, it's a hell of a lot of fun so long as you can find a team that plays like, well, a team.